Tonio Darmanin drives the Bentley Bentayga. It came as no surprise that, among the impressive collection of exotic cars one finds on our island, we also have a Bentley Bentayga. When I bumped into an old friend who told me he had recently acquired one, I very willingly accepted his kind offer to take it out for a spin. The Bentley Bentayga combines unparalleled luxury with effortless performance and everyday usability. 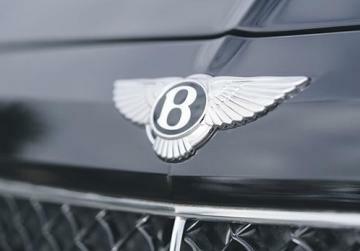 When it was launched in September 2015, with an all-new W12 powertrain, Bentley claimed that it was the fastest, most powerful, most luxurious and most exclusive SUV in the world. The Bentayga offers a true Bentley driving experience and showcases innovative technology features. Designed, engineered and handcrafted in Crewe, the UK, the Bentayga’s styling is pure Bentley. Sculptural with an elegant, timeless execution, it balances athleticism with confidence. From the four round LED headlamps and large matrix grille, to the distinctive power line and muscular haunches, the Bentley DNA is apparent throughout. The Bentayga boasts the world’s finest automotive cabin, with unrivalled levels of precision. The detailing in metal, wood and leather – including meticulous tolerances between elements of trim – is the epitome of modern British luxury. An all-new twin-turbocharged 6.0-litre W12 engine is at the heart of the new Bentayga. The mighty 12-cylinder unit combines efficiency and refinement with ultra-luxurious levels of power and torque. With 600bhp and 900Nm delivering a 0-60mph time of 4.0 seconds and a top speed of 187mph or 301km/h, the Bentayga still holds the title of the world’s most powerful and fastest SUV. 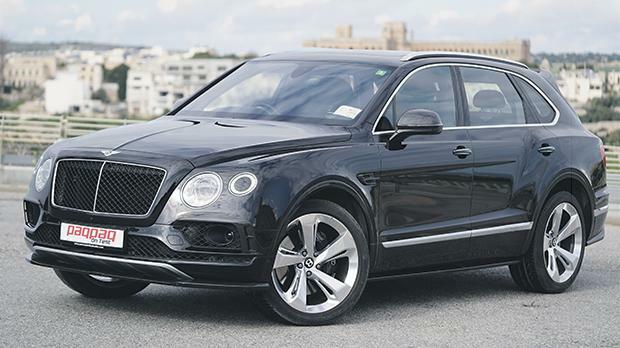 The Bentayga diesel, on the other hand, is the first diesel model in Bentley’s history. 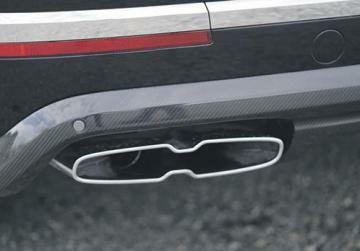 This all-new, technologically advanced, triple-charged, 4.0-litre, 32-valve V8 engine develops 429bhp and 900Nm of torque, the Diesel hits a top speed of 168mph or 270km/h and can accelerate from 0-60mph in an equally impressive 4.6 seconds. The Bentayga’s wheel arches, fenders and bonnet deliver a balance between sportiness and SUV presence. The ultra-sharp Bentley power line and muscular rear haunch display a taut tension in side profile, as part of the largest single-piece aluminium pressing in the automotive world. 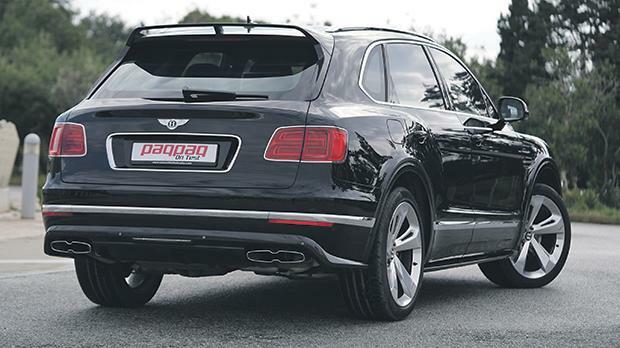 Trademark Bentley features such as the large matrix grille and B-shaped wing vents afford the Bentayga a modern, dynamic elegance. The grille is flanked by four distinctive floating all-LED headlamps. 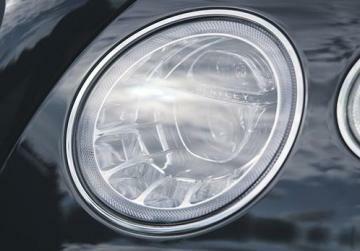 The lights sit flush within the seamless super-formed aluminium front fenders. Innovative design features, like the discreet headlamp washers contained within the outer lamp’s body-coloured centre, demonstrate remarkable attention to detail. 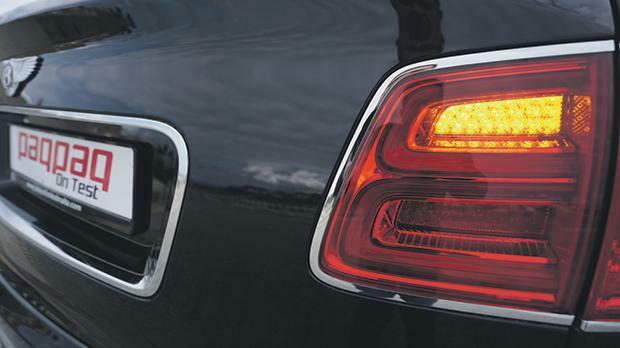 At the rear, within the segmented tail lights, a new B-shaped illumination graphic is incorporated that affords the Bentayga an instantly recognisable and striking night-time signature. Step inside the Bentayga and you find one of the finest automotive interiors in the world, with handcrafted wood and leather throughout – engineered with precision to deliver absolute perfection. The attention to detail in metal, wood and leather is the epitome of modern British luxury and is only achievable thanks to the exceptional skill of the workforce in Crewe. The Bentayga’s cockpit sets new standards for both luxury and precision, with meticulous tolerances between the exquisite veneered woods and metal elements. The dashboard takes the iconic Bentley wing design as its inspiration, with the beautifully finished surfaces flowing gracefully from door to door over the top of the instrument binnacles, down under the centre console and back up around the passenger side fascia and foot well. Highly polished, handcrafted metal elements adorn the dashboard, centre console and doors. Trademark Bentley knurling on the drive mode selector, gear knob, iconic bulls-eye vents and organ pulls adds sophistication and tactile refinement. Sumptuous front seats, individually handcrafted in Crewe and featuring 22-way adjustment including adjustable cushion and backrest bolsters, provide superb support and comfort for all conditions. This cosseted feeling is further enhanced with a six-programme massage system, seat heating and ventilation. The car can be specified as a four-, five- or seven-seater. A suite of state-of-the-art driver assistance systems and infotainment features designed to enhance safety, comfort and convenience make the Bentayga an innovative, advanced and connected luxury SUV. It offers the widest range of on- and off-road drive settings of any vehicle via Bentley’s drive dynamics mode and optional responsive off-road setting. Up to eight modes are available, allowing drivers, at the simple turn of a dial, to select the perfect dynamic set-up for any surface or road condition. Predictive adaptive cruise control uses the navigation data, sensors and cameras to predict upcoming corners, city boundaries and speed-limit changes and can then modify the vehicle speed accordingly, improving both comfort and fuel economy. Rear crossing traffic warning, which uses radar technology to detect crossing traffic when reversing out of a parking space and top view, a system which uses four cameras to display an overall picture of the vehicle’s surroundings – combine to enhance everyday usability. Other innovative systems available on the Bentayga include electronic night vision, which uses infra-red technology to identify potential obstacles ahead, and a head-up display, which reduces driver distraction and increases safety. The Bentayga’s all-new, cutting-edge eight-inch touch screen infotainment system boasts class-leading navigation technology, a 60GB hard drive, and a choice of up to 30 languages. 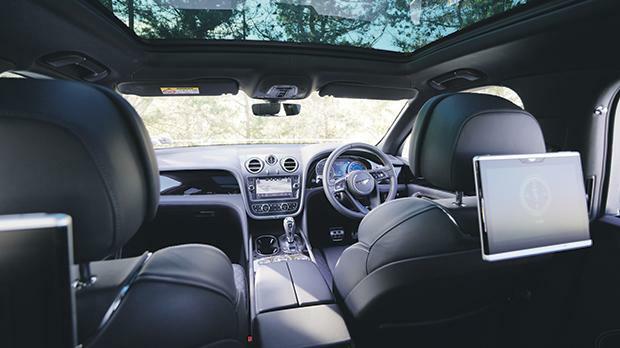 Rear seat passengers benefit from the introduction of the Bentley entertainment tablet – a removable 10.2-inch Android device with 4G, WiFi and Bluetooth for effortless, high-speed on-board connectivity. Customers can choose between three different sound systems for the Bentayga: Bentley Standard Audio, Bentley Signature Audio and Naim for Bentley Premium Audio. The latter is the most powerful system in the segment, with 1,950W, a network of 18 speakers and super-tweeters for unrivalled recreation of the highest audio frequencies. A full-length panoramic sunroof with acoustic interlays allows ample natural sunlight to highlight the surfaces and detailing. Activate the hands-free tailgate and not only is a large, practical storage space revealed, but also another of the Bentayga’s unique features – the optional folding event seat. Ideal for those wishing to stop for a moment and enjoy a spectacular outdoor environment or pursuit, the innovative leather-trimmed folding seat matches exactly the style of the cabin seats and integrates seamlessly into the rear of the car with characteristic attention to detail. Never before has a vehicle so coherently combined genuine luxury with go-anywhere driving ability. The development programme for the Bentayga has been the most exhaustive in the Bentley brand’s history, ranging across five continents. From the dirt and gravel of South Africa and the dunes of Dubai, to the muddy fields of Cheshire, and from -30°C in the frozen North Cape to searing 50°C desert heat, the Bentayga’s ability to perform on any surface and even in the most extreme conditions has been proven. The Bentayga has also driven more than 400 laps of the famous Nürburgring Nordschleife circuit, as part of developing the dynamic performance of the chassis and fine-tuning the relevant control and stability systems. Typically included in the exhaustive option list is a bespoke mechanical Mulliner Tourbillon by Breitling clock. The most complex of watch mechanisms, the Mulliner Tourbillon is automatically wound periodically by a dedicated high-precision winding mechanism within the car. This masterpiece is machined in solid gold (customers can select from either rose or white gold), with a choice of either a mother-of-pearl or black ebony face and decorated with eight diamond indexes. Sitting snugly between the Lamborghini Urus and the Rolls Royce Cullinan, the Bentayga offers an interesting balance between outright performance and extraordinary levels of luxury and comfort.